Since their introduction to North America, wild pigs have become one of the more serious wildlife problems in the United States. A confirmed feral swine population in New Hampshire, primarily in Grafton, Sullivan and Cheshire Counties, presents a unique management challenge. In most states, feral swine are considered an invasive or exotic species. Natural range expansion and illegal introductions, coupled with the extreme adaptability of feral swine, fuel the continued spread of this destructive animal. The U.S. Department of Agriculture/APHIS-Wildlife Services (WS) is a good resource for landowners who may be experiencing property and or agricultural damage. WS provides partnership-based Federal leadership to help resolve wildlife conflicts through an integrated wildlife damage management (IWDM) approach. The WS New Hampshire Program also participates in the WS National Wildlife Disease Program’s feral swine disease surveillance and monitoring efforts. 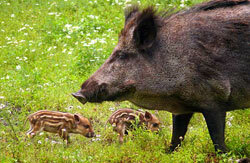 Can feral swine be hunted in New Hampshire? Feral swine have no legal game status in New Hampshire, but are considered escaped private property and may only be hunted with permission of the property owner. 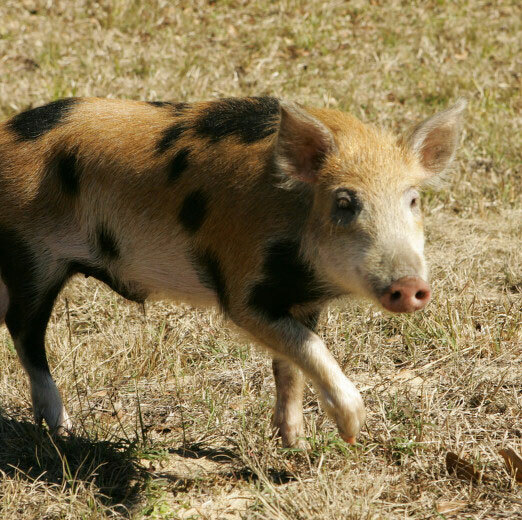 Since 1949, feral swine have been defined in the state as animals “Running at Large” under RSA 467:3. In southwestern New Hampshire, where the vast majority of the state's feral boar exist, they are considered the property of Blue Mountain Forest Association, a privately owned preserve located in Croydon, NH Permission is required to hunt free-ranging wild boar that escape from this property. If permission is granted (which it typically is), you will need to have a current regular NH hunting license, and you must hunt within legal hunting hours. 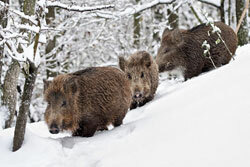 Note that feral wild boar are limited in number and are difficult to locate without local knowledge. Sow and piglets. 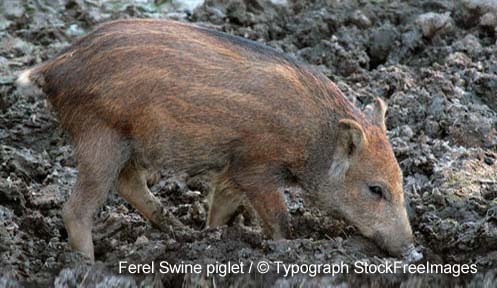 Feral swine have the greatest reproductive potential of any large mammal worldwide. 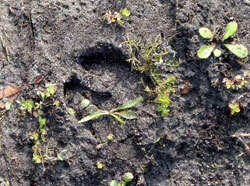 Feral swine tracks, shown above, are rounder and more blunt at the tips than those of deer.